For better or for worse, people are going to be quoting Anchorman 2 for years to come, but can it, and it’s catchy one liners, live up to the original or is it just another sequel that should never have been made. Finding himself being overshadowed by his wife Veronica, anchorman Ron Burgundy takes an opportunity to change the way news is reported forever by joining up with the worlds first ever 24 hour news channel GNN. Will the anchorman and his friends be able to thrive in the competitive new work environment or have they become outdated? For any fan of the original, this film isn’t going to disappoint. It’s full of the same well timed catchphrases and witty dialogue that made the first one so popular, but if you didn’t like the first film than this sequel will do little to change your mind. The film is a little too long, at two hours long it feels like the movie would have benefited from a shorter running time. Even though the film drags a bit towards the middle, there are moments later in the film that make up for it. One of the best things about the movie is how the characters make fun of the way news is today, even making valid points about some of the problems facing the industry without ever becoming too serious or preachy. A lot of people will probably be surprised at how a piece of valid social commentary is seamlessly slipped in to the ridiculous gags that fans of the film know and love. Will Ferrell and friends have managed to make a proper sequel that doesn’t rely on or try to repeat the story of the first one and it paid off as this sequel is arguably a superior film. 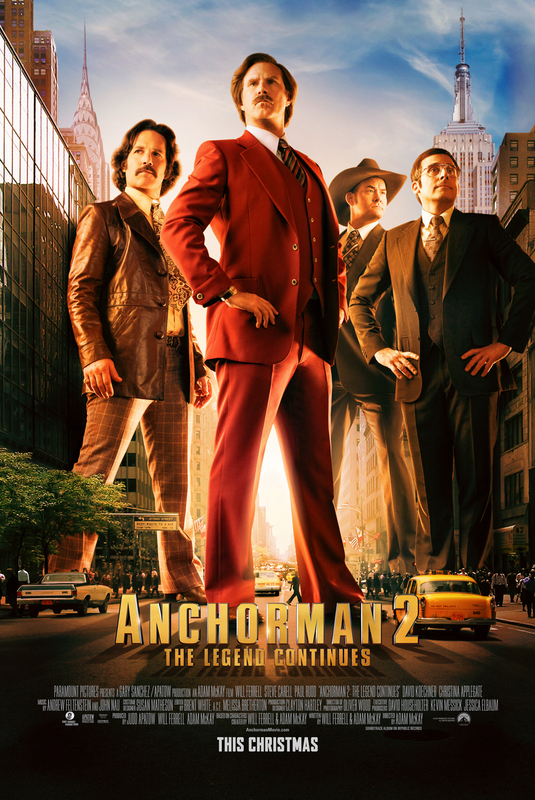 Funny to the end, Anchorman 2 should definitely please its existing fans while possibly bringing in new ones. What do you think? Are you an anchorman fan? Did you want a sequel? Leave your thoughts in the comments below. This entry was posted on December 15, 2013 by adamodwyer1. It was filed under Comedy and was tagged with anchorman 2, movie, review, sequel.